Friends keep sending me items they read about Naples, wanting to know if this, that, and such-and-such are really so. It's all true, all true, I tell them, especially the parts about the noise, traffic jams, great food, beautiful babes and entire portions of the peninsula cracking off and washing into the Mediterranean during our monthly earthquakes. 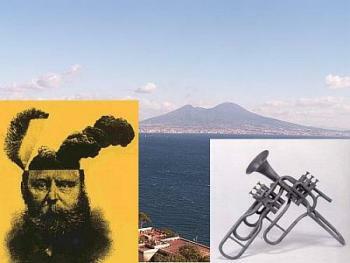 I forgot the eruptions of Vesuvius. That damned thing goes off incessantly. The article my friend sent me is about something which supposedly happened in a jazz club in Naples. It says: "A trumpet player died on stage when he blew so hard trying to hit a high note that his head exploded. He was playing the end of 'The Impossible Dream' from Man of La Mancha when his head swelled and burst like a balloon." Being a trombone player, myself, I have a survival interest in such matters, so I called around to find out the truth. No one seems to know anything about it, but if you are a concerned parent contemplating music lessons for your children, you may be more at ease if you know something about the HEP (Head Explosion Potential) of musical instruments. The safest instrument for your child to play —virtually zero on the HEP scale— is the piano, since your youngster's head is unlikely to explode unless the piano falls directly on it. Another safe instrument is the cymbals. ("IS" the cymbals? That singular verb with a plural predicate doesn't sound right, but "Is the cymbal" doesn't sound too good, either. Actually, a singular cymbal doesn't sound at all, and your kid won't find much work if he or she plays only one of them). Anyway, research (yes, done with your tax money!) has shown that in order to explode the head by clapping cymbals together on it would take an articulated neck such as found only among the phylum Arthropoda, so unless your child looks like that creature in Alien, cymbals are o.k. Be warned, however, that a few percussionists have willfully contorted themselves into a suicidal posture and cymballed themselves to death, depressed because after years of practice they finally figured out that you can't play a melody on the damned things. As for trumpets, HEP is pretty low (or "statistically insignificant," as I might say if I were writing this up for some yuppie business journal). You might blow so hard that you injure the eustachian tubes leading to the middle ear, or you might actually push your teeth in if you are a high-note specialist with gum disease. But exploding heads? I don't think so. Even the colors you turn as you play higher and harder on the trumpet aren't that impressive. (It has been claimed that making any loud noise at all will make you change color. Even in animals. A recent issue of the Journal of Strange Veterinary Medicine carried a report about a cow that bellowed so loud it turned purple. The report was entitled: "The Cow that Mooed Indigo"). With the trumpet, generally, your face first turns red and then goes blue, but just barely. Now, oboe players, on the other hand, really get some serious angstroms going; they warp up past the visible spectrum into the ultraviolet and beyond almost immediately, not unlike the microwave oven in your kitchen, which is what has given rise to the musicians' slang phrase, "Man, this guy is really cookin'!" Obscene little topographies of veins bulge out on the oboe player's forehead, throbbing and wiggling like cobras being coaxed from their subdermal lair by the exotic sound of the instrument. But it's not the music, it's all that potentially explosive back-pressure from the notoriously difficult double-reed mouthpiece. An oboe player's head is, thus, a tiny hyperbaric pressure chamber with daredevil disdain for the red line! I think of those interminable passages in Tschaikovsky where the oboe just wails on and on, growing more Vesuvian with each passing measure, while the poor clarinets sit tacitly next door in Pompeii, fidgeting nervously and whispering things like,"Pssst! Sammy... I think Mort is getting ready to blow... ask the trumpet section if they want to change seats with us... they owe us one." You catch on fast. We're talkin' industrial-strength HEP, here! What about other instruments? I don't see any real dangers from violin playing. Callouses on the fingers are the worst that can happen. The tuba? Well, you can get laughed at, but that's about it. Typical Neapolitan instruments such as the mandolin, the zampogna, and the putipu might get you beaten up because they're all annoying, but your head won't explode from playing them. In short, except for the oboe, there are no real dangers lurking in Beginning Band, and before your child's head explodes from playing, your wallet will probably implode from paying for lessons. I guess the real question in this whole affair is this: What in the world was that guy doing, anyway—playing a corn-ball tune like "The Impossible Dream" in a jazz club? !